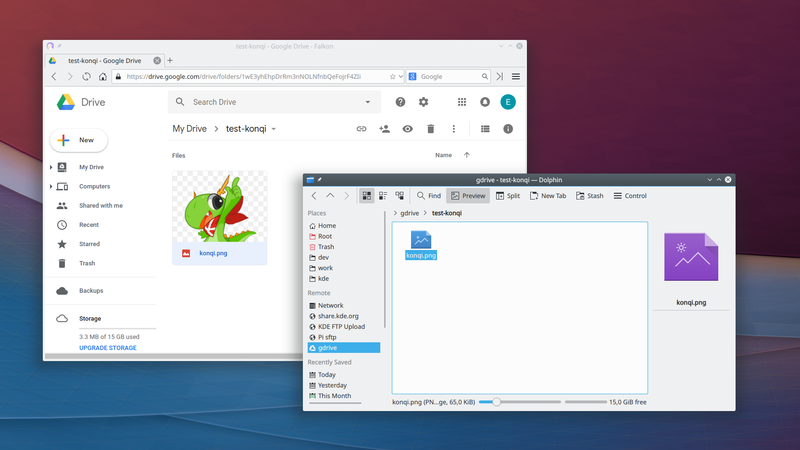 KIO GDrive is a KIO slave that enables KIO-aware applications (such as Dolphin, Kate or Gwenview) to access and edit Google Drive files on the cloud. Open the Network folder in Dolphin and click on "Google Drive". You can install into a different prefix, as long as is the same prefix kdeinit5 has been installed into. If you have problems building from source, feel free to ask for help in the #kde-fm IRC channel. Fixed a bug that caused the login dialog to show up again after authentication (bugs 367988, 369581). Fixed copy-pasting from gdrive:// URLs to local disk (bug 369619). Stop trashing all account files on account removal. Added TryExec key in the .desktop file. Replaced custom Dolphin .desktop file with a Google Drive link in the Network (remote://) folder. Fixed wrong write permissions in the top-level accounts folder. Fixed mimetype used to open .ods files (bug 388598). Fixed copy of files within the same gdrive account (bug 376735). Added missing copy of GPL3 license. Fixed opening files with special characters in their name (bug 395590). Fixed homepage URL in the appstream file. Fixed downloading of large files (bug 375765). Fixed component tag in the appstream file. This page was last modified on 22 October 2018, at 06:23. Content is available under Creative Commons License SA 4.0 unless otherwise noted.